A gravity bridge within High Charity's Tower Districts. 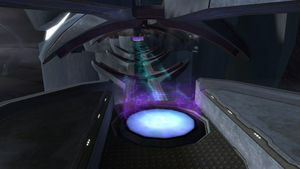 The gravity bridge is a form of transport used by the Covenant. It consists of a horizontal anti-gravity field, often over a large gap, substituting a physical bridge. Whoever enters a pedestal at one end of the anti-gravity field will immediately float up a few feet and be carried to the other side of the bridge at a high speed while suspended in a stasis field that prevents them from falling off. Gravity bridges may be configured to move individuals over a linear or curved path. In the Covenant holy city of High Charity, gravity bridges connected some of the structures between the towers lining the dome, including the Hanging Gardens and the Valleys of Tears. Curved gravity bridges were present in a large chamber within the Sanctum of the Hierarchs which housed shards of glass from worlds glassed by the Covenant, serving as a means of access between anti-gravity platforms suspended along the rim of the room. While the horizontal gravity bridges in the Hanging Gardens and the Valleys of Tears were always on, the field portion of the curved variety observed in the Sanctum chamber activated only when one entered the access pedestal and faded out immediately after the bridge had been used. View of a gravity bridge in High Charity's tower districts. Viewpoint of an individual suspended in a bridge's gravity field. A group of UNSC Marines being transported by a gravity bridge. A gravity bridge's access pedestal. A curved gravity bridge field connecting two anti-gravity platforms. A curved gravity bridge viewed from the opposite side. ↑ 2.0 2.1 Halo 2, campaign level Gravemind - "Inside Job"
↑ 3.0 3.1 Halo 2, campaign level High Charity - "Cross-Purposes"